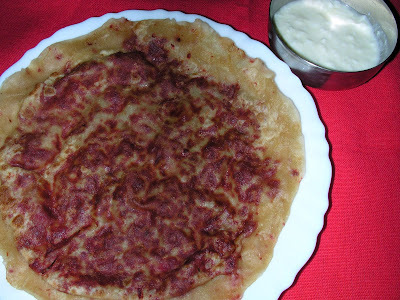 The beetroot paratha stands out for its bright red colour as the strong colour of the vegetable. Considering all the health benefits of beetroot, this is an easy way of getting your kid to eat them. I have added the step of grinding the beetroot into a fine paste so that little kids who dont like to chew can eat it easily, this step can be ommitted if you are preparing it only for older kids and adults. A recommended dish to include in the family diet on a regular basis. Wash clean the beetroots, peel and grate. Then run i the grated beetroot in the blender in batches to get a fine paste. Put this paste on pan, add the cumin powder and cook till the water is absorbed and the paste is relatively dry. Add the paneer, salt and pepper. Mix well and take off the fire. Your stuffing is ready. Roll out 2 rotis. Spread the stuffing evenly on one roti. Place the other roti over it and press the edges firmly. Heat the girdle and fry both sides. Top with ghee or butter and serve hot. beetroot juice is very healthy and instead of burning all of it, it would be more useful dat we squeeze out as much juice as we can and use it to knead the atta dough along w/water.dont u think it;; b more nutritious!! Could I use cooked/boiled beetroot? Try it out Sarah and let me know how it goes.